New research findings contradict a fundamental assumption about the functioning of “organic” solar cells made of low-cost plastics, suggesting a new strategy for creating inexpensive solar technology. 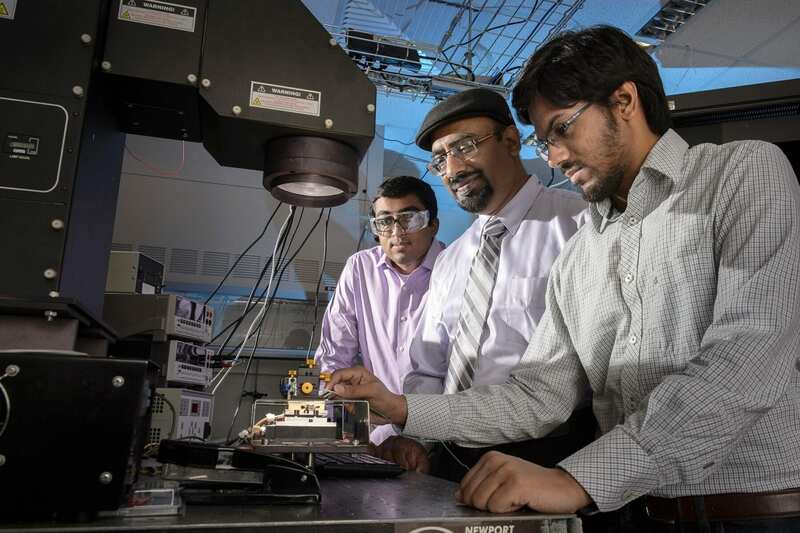 “These solar cells could provide a huge cost advantage over silicon,” said Muhammad Ashraful Alam, Purdue University’s Jai N. Gupta Professor of Electrical and Computer Engineering. “This has been the hope for the last 20-25 years,” said Bryan Boudouris, an assistant professor of chemical engineering. “Now it appears there is no fundamental reason why organic cells have to be less efficient than silicon,” Alam said. “Biswajit had the courage, conviction, and persistence to do a series of difficult experiments, and he was ably supported at various stages by doctoral students Aditya Baradwaj and Ryyan Khan,” Alam said. The primary bottleneck to more efficient organic solar cells is rooted in the fundamental workings of the organic photovoltaic technology. As the semiconducting material is illuminated with light, electrons move from one energy level to another. Due to the atomic structure, the electrons in the semiconductor occupy a region of energy called the “valence band” while the material is in the dark. But shining light on the material causes the electrons to absorb energy, elevating them into a region of higher energy called the “conduction band.” As the electrons move to the conduction band they leave behind “holes” in the valance band, generating so-called electron-hole pairs in the plastic solar cells called excitons. This “charge separation” is maintained by inserting numerous structures called bulk heterojunctions, a design that has been a challenge to manufacture in a high-speed, large-scale and reproducible manner. “He inverted the structure and explained that the inefficiency is taking place because the electron-hole pairs are not staying separated,” Alam said. March 18, 2019 - New Record: Over 16 Percent Efficiency for Single-Junction Organic Solar Cells R & D MagazineAs a promising technology for renewable energy, organic solar cells (OSCs) have attracted particular interest from both industrial and academic communities. April 15, 2019 - Solar Energy Markets: A 2019 Research Outlook to 2023, with General Electric Company, Kyocera Corp, Mitsubishi Electric Corp, Schneider Electric, St. Gobain, and Parker Hannifin Dominating - ResearchAndMarkets.com Associated PressPress release *content* from Business Wire. The AP news staff was not involved in its creation. March 21, 2019 - Light from exotic crystals improves solar panels Futurity: Research NewsControlling light from exotic crystal semiconductors could pave the way for better solar panels, displays, and more.